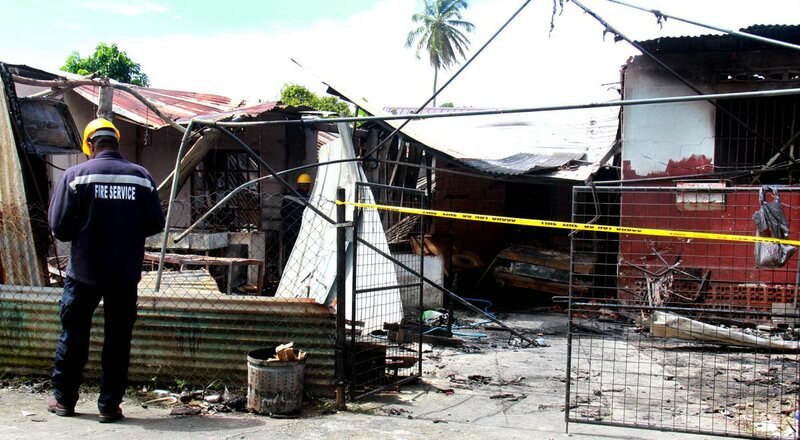 Fire officers on the scene where two homes belongs to the Rampersad family was destroyed by fire on Divali Night at Baksh Settlement, Mc Bean Couva leaving 10 homeless. PHOTO BY ANIL RAMPERSAD. GRANDFATHER of eight Michael Rampersad did not let his grandchildren play with fireworks at their home at Baksh Settlement, McBean, Couva. Over the years he warned them and others in the community of the dangers of their children playing with fireworks and scratch bombs. On Divali night, his worst fears materialised when he got a phone call telling him his home had been destroyed in a fire believed to have been caused by a scratch bomb thrown inside by a group of children. 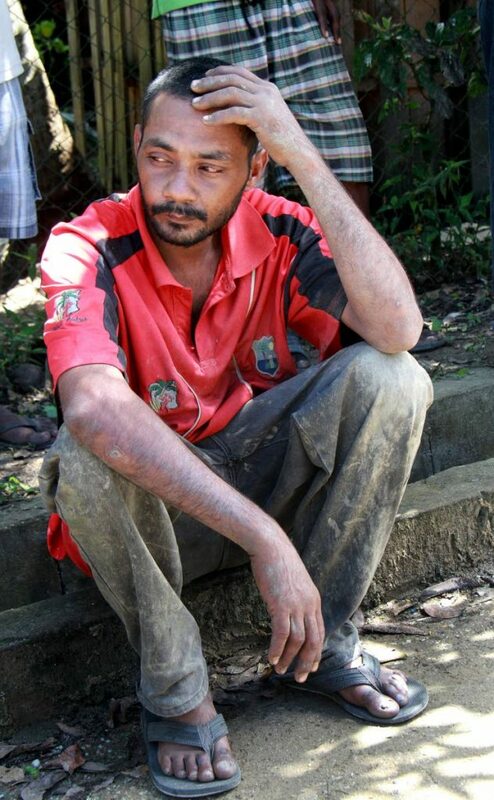 The children, aged nine-12,were playing with the explosives in front of Rampersad’s home. Roger Rampersad sits on the road side after his family home was destroyed by fire on Divali Night at Baksh Settlement, Mc Bean Couva leaving 10 homeless. Three homes and a family business were destroyed. Rampersad lived alone in one house. His son Jimmy Rampersad, 36, lived with his wife Videya, 34, and their four children. Another son, Roger lived there with his wife Sharda Pooran. Early estimates have put their losses at approximately $2 million. 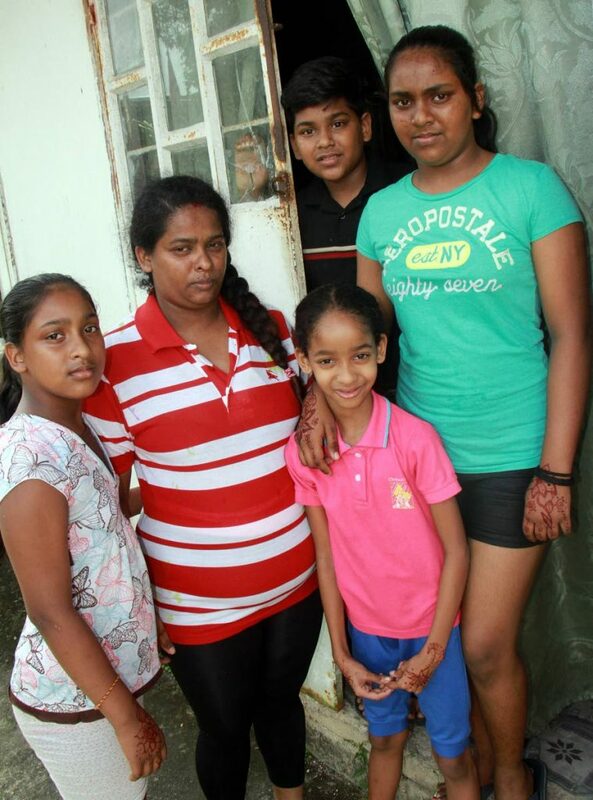 Second left, Vidya Rampersad and her children, at left, Michelle, 10, at front, Jenna, 7 at right, Vanita, 13 and Center back, Jeremiah 12 lucky to be alive when there family home was destroyed by fire on Divali Night at Baksh Settlement, Mc Bean Couva. The fire started at about 7pm. Rampersad’s son Roger and 12-year-old grandson were home alone. Luckily they managed to run out of the burning house. Other family members were at a relative’s wake, and Rampersad said he had gone to visit a friend – but when he left he called another relative and reminded him to warn the children not to play with fireworks or scratch bombs near his house. He said last year too, around Divali, despite his warnings, children were in front of his house playing with fireworks and scratch bombs and an explosive was thrown into his yard. “It fell on a piece of sponge was there, so I ran quickly and threw water on it before it could spread.” Rampersad said his grandchildren’s schoolbooks and uniforms were destroyed. Three of the children are students of the McBean Hindu Primary School. The eldest child attends the Carapichaima East Secondary School. Two cars were also destroyed by fire. A relative was able to rescue four kittens and a dog from the blaze. Indarsingh said yesterday he spoke to the Social Development and Family Services Minister, Cherrie-Ann Crichlow, who said the families would be given grants they are entitled to. Anyone wishing to help the families can call 318-4527 or 487-299. Couva police and firemen are investigating.